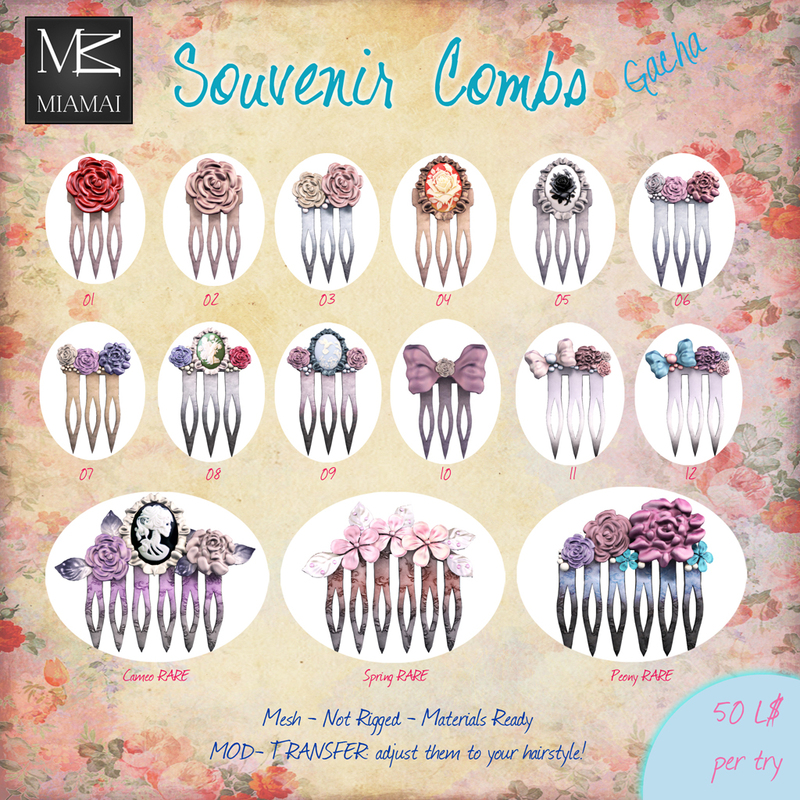 Miamai has created a wonderful new Gacha for Shiny Shabby, the Vasilisa Purses. These stunning handbags come in a variety of styles, all beautifully crafted to be the perfect accessory for your spring outfits. You will delight in the unique vintage fabric’s, beads, and clasps that are used in this collection of purses. 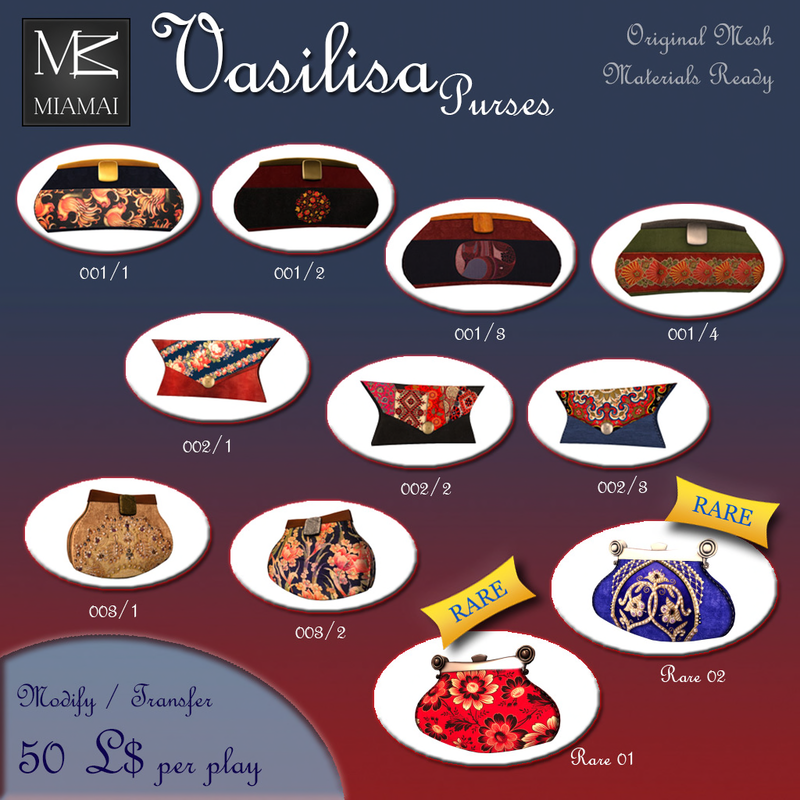 The Vasilisa Purse Gacha has 9 commons and 2 rares that are transfer, modify, materials, and all are 100% original mesh creations by Miamai, and only available at the April round of Shiny Shabby. Shiny Shabby opens at 12 pm SLT on the 20th of April and closes on May 15th. Miamai is participating in the TAG! 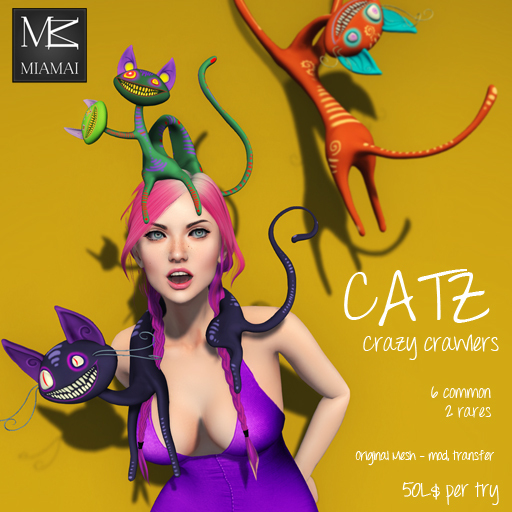 Gacha and has the cutest freak show goodies for you, CATZ – Crazy Crawlers. These mischievous little critters will add a bit of excitement to your life as they lounge about, perch on your head, or just hang on! The perfect accessories for any outfit to add a crazy twist! At 50L per play you can collect them all! Go to the starting point to get your hud and begin your game of TAG! Miamai for your home? Absolutely! Miamai has brought the unique style that has defined Miamai fashion to items for your home! 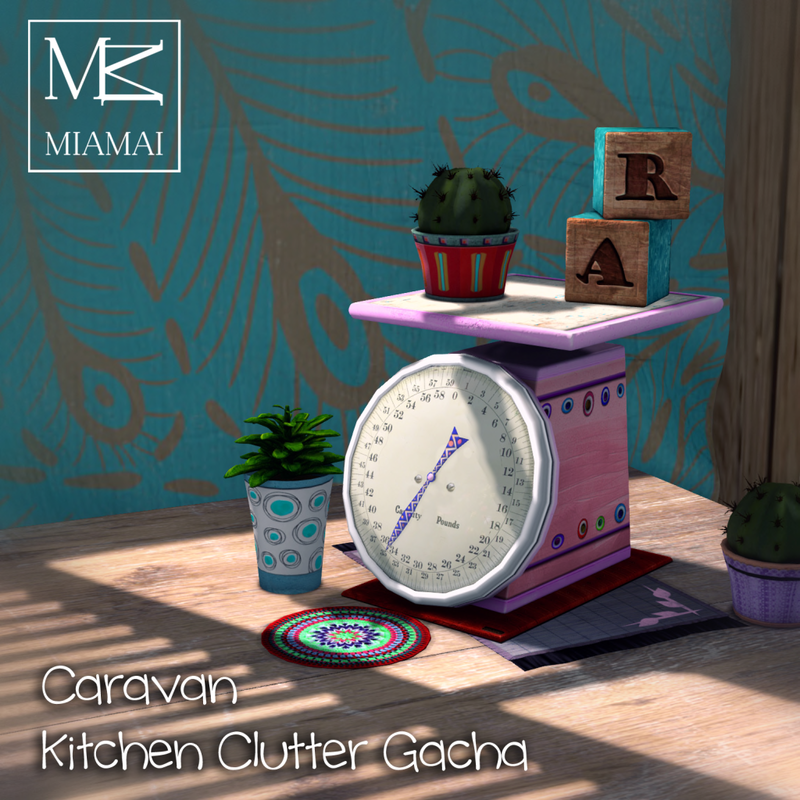 Miamai has released a wonderful grouping of boho inspired accessories for your kitchen, the Caravan Kitchen Clutter Gacha. Quirky and fun these pieces will add the finishing touches to individualize your kitchen space. 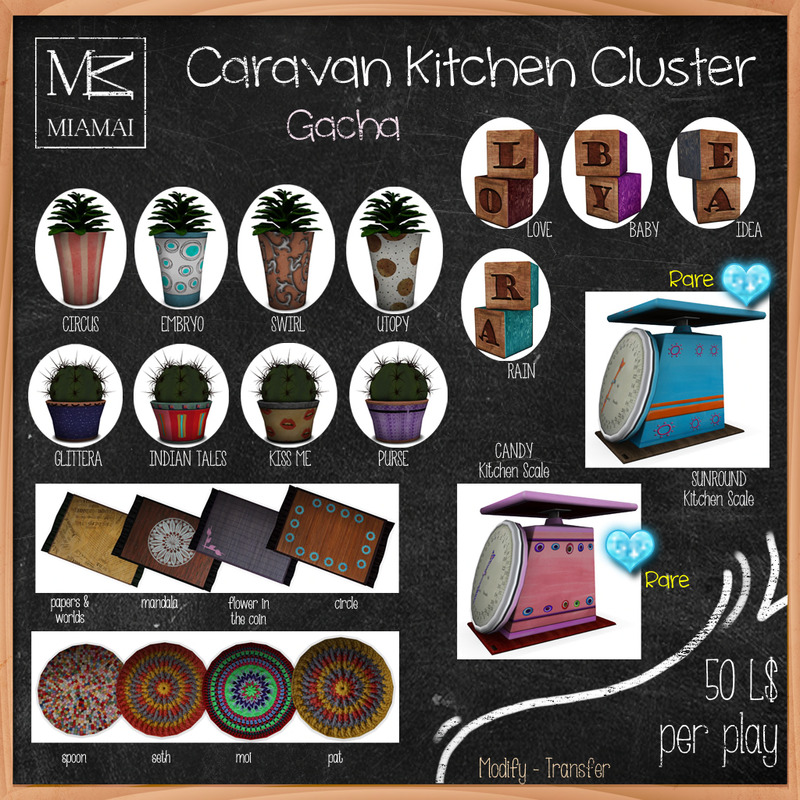 Only available at the March round of Shiny Shabby the Caravan Kitchen Clutter Gacha has 20 commons and 2 rares that are transfer, modify, materials, and is a 100% original creation by Miamai. Shiny Shabby opens at 12 pm SLT on the 20th of March and closes on April 15th. Miamai’s new MerCombs are exclusively at The Fantasy Collective this month. 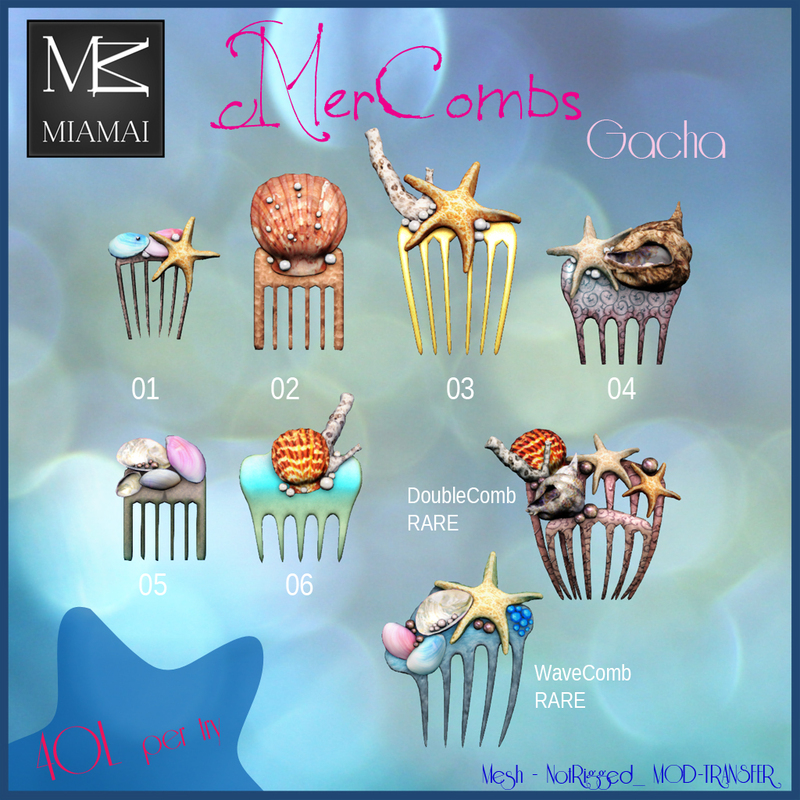 This gacha is for mermaids and everyone who adores shells and hair combs! Each comb is beautifully detailed and decorated with a variety of starfish, shells, coral, and pearls. There are 6 commons and 2 rares to collect! At 40L per play you can collect them all and share with friends! 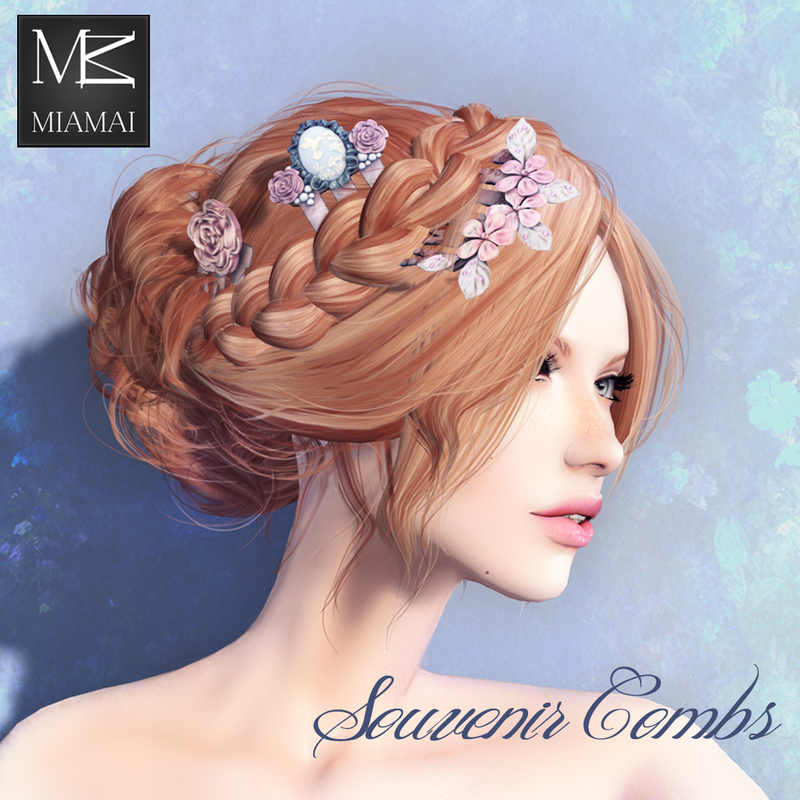 Miamai’s new MerCombs are 100% original mesh creations, non rigged, modify, and transfer. Cirque de Seraphim is a multi-sim, circus-themed event that MIAMAI has the pleasure of being a sponsor for and supporting the ASPCA (American Society for Prevention of Cruelty to Animals). Cirque de Seraphim runs November 6th 2014 to November 26th 2014 and also has rides and games along the boardwalks. Come enjoy this amazing event with us and help us support the ASPCA at Cirque de Seraphim. GACHA? Of course we have one for Cirque de Seraphim! 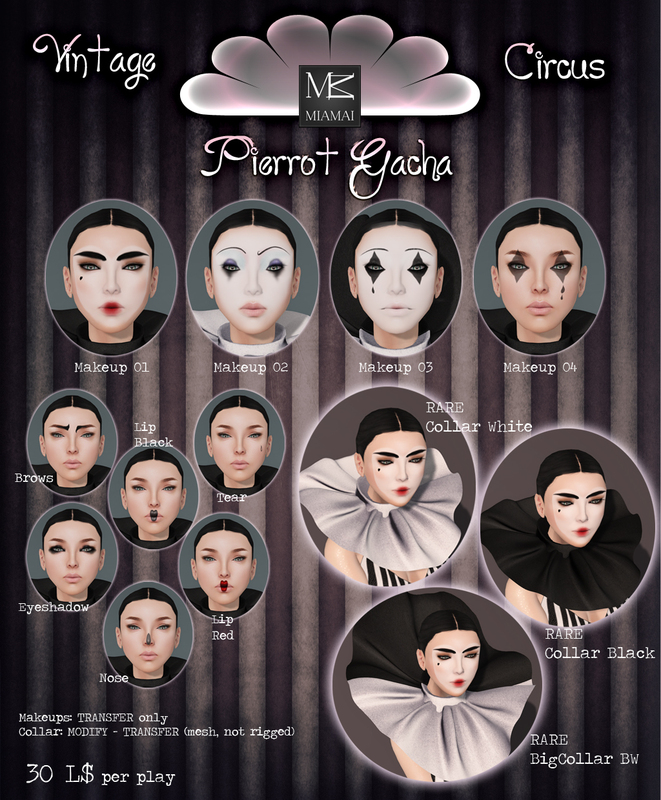 The Vinatge Circus Pierrot Gacha has, 11 makeup/facial tattoo layer commons plus 3 stunning Pierrot mesh collars for the rares! Visually stunning and essential for the Vintage Clown you will want to collect them all!